This PDF 1.5 document has been generated by LaTeX with hyperref package / pdfTeX-1.40.14, and has been sent on pdf-archive.com on 11/03/2015 at 06:07, from IP address 1.120.x.x. The current document download page has been viewed 663 times. File size: 760 KB (4 pages). rates of change is urgently needed. updated analysis (see Supplementary Section 7). Recently Ross et al. uptake, but only as averages over the entire twenty-first century4 . distinguishable from natural variability on this timescale (Supplementary Figs 2 and 14). CMIP5 regional 40-year rate of change. value, is substantially higher than in the historical period (Fig. 3). from the 1891–1910 period (see also Supplementary Section 3.2). © 2015 Macmillan Publishers Limited. All rights reserved. to 1900 and the CMIP5 climate model archive for the period 1850–1930. each region (Supplementary Table 2). Figure 1 | Rates of temperature change over 40-year periods for a number of climate reconstructions that cover various Northern Hemisphere areas. rates of change are about 20% smaller than Northern Hemisphere land + ocean rates of change in the CMIP5 archive (Supplementary Section 3.4). periods ending in 2011–2020, solid lines) from the RCP4.5 scenario. averages over land + ocean areas in each region. scenario (a) and the GCAM 4.5 W m−2 climate stabilization scenario (b). model and the HADCRU record. 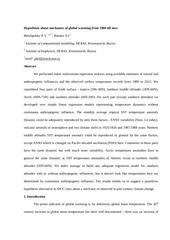 spread in results is due to the assumed range in climate sensitivity. which has a faster response to forcing than forcing over oceans. those of aerosol forcing assumptions (Fig. 4). declines in the near-term as climate policy is implemented15,16 . example, ≤2.0 ◦ C/CO2 -doubling). with observed warming to date17 . higher rates of change throughout the century (Fig. 4). not capture the recently observed decrease in the rate of warming. absence of anthropogenic forcing changes25 . 9. Smith, S. J. et al. Anthropogenic sulfur dioxide emissions: 1850–2005. Atmos. Chem. Phys. 11, 1101–1116 (2011). sulfur dioxide: 2000–2011 emissions. Environ. Res. Lett. 8, 014003 (2013). by 2100. Climatic Change 109, 77–94 (2011). emissions. Climatic Change 109, 33–57 (2011). end of the age of aerosols. Atmos. Chem. Phys. 14, 537–549 (2014). 15. Smith, S. J., Pitcher, H. &amp; Wigley, T. M. L. Future sulfur dioxide emissions. Climatic Change 73, 267–318 (2005). scenarios. Proc. Natl Acad. Sci. USA 105, 15258–15262 (2008). inconsistent with past warming. Environ. Res. Lett. 8, 014024 (2013). 18. Meehl, G. A., Arblaster, J. M., Fasullo, J. T., Hu, A. &amp; Trenberth, K. E.
hiatus periods. Nature Clim. Change 1, 360–364 (2011). 19. 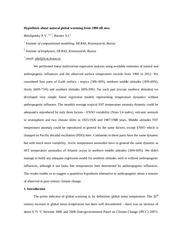 Easterling, D. R. &amp; Wehner, M. F. Is the climate warming or cooling? Geophys. Res. Lett. 36, L08706 (2009). prediction of the global warming slowdown in the past decade. Nature Clim. observations up to 2011. Environ. Res. Lett. 7, 044035 (2012). 23. Meehl, G. A. et al. Decadal prediction—can it be skillful? Bull. Am. Meteorol. climate predictions. Bull. Am. Meteorol. Soc. 90, 1095–1107 (2009). climate change impacts. WIREs Clim. Change 4, 121–150 (2013). IPCC Third Assessment Report. J. Clim. 15, 2945–2952 (2002). energy balance climate model to simulate and diagnose A/OGCM results. Clim. Dynam. 17, 601–613 (2001). PAGES 2k palaeo-climate analysis (see Supplementary Information). clarity and because these are known to be particularly important in this context. uptake4 , would widen the range of results. Intergovernmental Panel on Climate Change (IPCC) ‘‘reasons for concern’’. Proc. Natl Acad. Sci. USA 106, 4133–4137 (2009). experiment design. Bull. Am. Meteorol. Soc. 93, 485–498 (2011). of ocean diffusivity and climate sensitivity on the rate of global climate change. millennium. Clim. Past 6, 723–737 (2010). past two millennia. Nature Geosci. 6, 339–346 (2013). (eds Stocker, T. F. et al.) Ch. 12, 1029–1136 (IPCC, Cambridge Univ. is operated for DOE by Battelle Memorial Institute under contract DE-AC05-76RL01830. Climate Model Diagnosis and Intercomparison provides coordinating support for CMIP. permissions information is available online at www.nature.com/reprints. Correspondence and requests for materials should be addressed to S.J.S. This file has been shared by a user of PDF Archive. Document ID: 00213623.